If blanketing UK cities with a thick scopic fog of CCTV cameras weren't enough, the countryside may soon find itself placed under similar heavy surveillance. But this, curiously enough, might be a good thing. 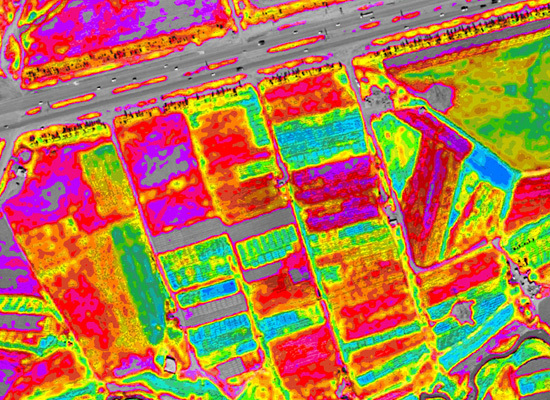 The data collected was then used to create a Normalised Difference Vegetation Index (NDVI) map, which “tells you the difference between 'green crops' that are photosynthesising and bare ground.” Where there is bare ground, more fertilizer may be needed. 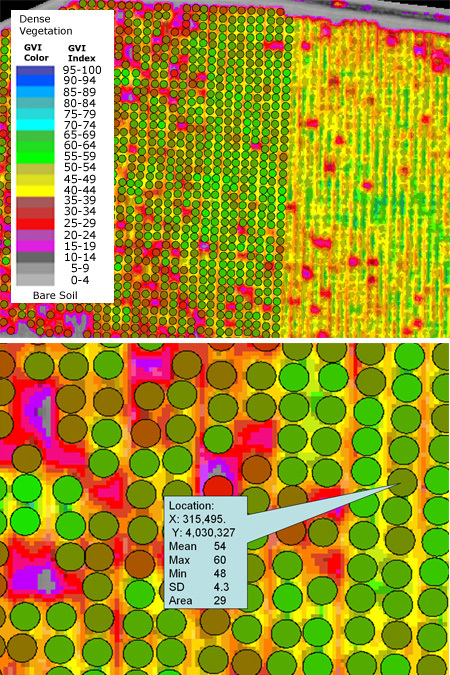 Equipped with this NDVI map, some GPS locators and a techno-pimped out John Deere, farmers would thus be able to target areas in need of supplemental nutrients and to better estimate how much to use, potentially releasing less fertilizers that otherwise would leach out and pollute water sources down the hydrological line. This is precision farming. Of course, you can use the same information-gathering technique to monitor other environmental conditions, such as soil moisture, disease outbreaks and pest population. The ecological impact is potentially huge. Imagine only watering crops that need to be watered (and only when required) instead of flooding the entire field. Imagine as well spraying just those diseased plants with herbicides (and only when there is an outbreak) instead of suffocating acres and acres of fields with poison all the time. Better yet, you send in a cadre of Medusa agrobots networked to GPS satellites to surgically excise these botanical tumors. With a surveillance network such as this, one wonders if you can re-purpose it to monitor other things, say, the urban poor doing a bit of nighttime grocery shopping while the food crisis and subprime armageddon rage on in the inner cities. When detected, they get sprayed with herbicides. How about GMO crops? Design these neo-plants to emit a characteristic glow in the infrared or ultraviolet wavelength, and you can be alerted when they've jumped the fence. And don't forget to allocate part of the network to keep a look out for anti-GMO anarchists. It's entirely possible that future pharms will be as heavily monitored as prisoners at Guantanamo Bay and as maniacally firewalled as CIA servers. Meanwhile, how about using a similar surveillance network to monitor acts of agro-criminality? As food prices have soared in recent months, farmers in the UK and in the U.S. have started to abandon conservation programs. Through these programs, farmers receive government subsidies for letting some of their fields lay fallow, but not as much if they were to now grow cash crops like wheat, soybeans and corn. Consequently, many of these uncultivated croplands, which have greatly helped restore wildlife habitats and reverse topsoil erosion, are being farmed once again. Farmers are required to notify the government when they opt out of these programs. But do they really? Could they not be alerting the local agriculture bureau in order to keep their subsidies? Specially in the U.S., it's rather difficult to tell if a farmer is being honest or not. There is just too much land. 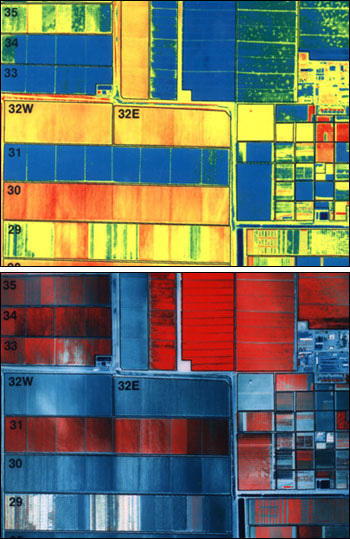 To make it easier to detect promises kept and promises broken, the U.S. Department of Agriculture initiated the National Agriculture Imagery Program (NAIP). 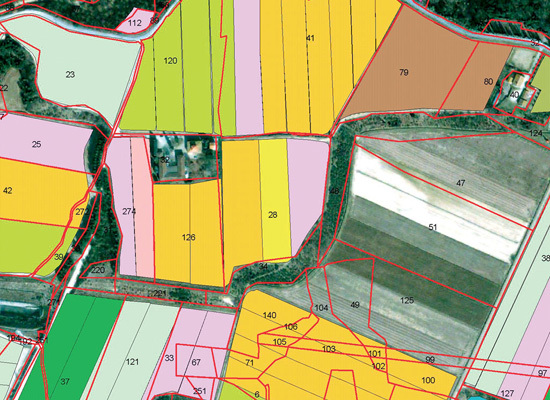 We are told that the maps generated from these overhead reconnaissances aren't released to the public, as doing so might violate the farmers' privacy. But imagine releasing them to the internet wilderness of distributed grid computing, data pornographers, meme-hungry social networking sites, open source virtuality and web-savvy eco-guerrillas. It'd be like Stardust@home or SETI@home, except you're asking the teeming Web 2.0 masses to look for terrestrial counterfeit. Instead of surveying the Martian landscapes for uncatalogued craters and landforms, citizen agro-agents will survey nearer terrains in search of horticultural deviants, the tenuous peace between the urban and the rural be damned. Persuade Wired, Boing Boing, Engadget, Slashdot and even Land8Lounge to blog about this, and you could have an army of volunteers comparing maps for hours on end, late into the night, during lunchbreaks or boring studio lectures to spot planted fields where there should be reconstructed prairie or wetlands. This may even be the only time they get to interface with that other wilderness beyond the urban periphery — with Nature — for an extended amount of time. Protecting your tax dollars while saving the environment and enjoying the outdoors. 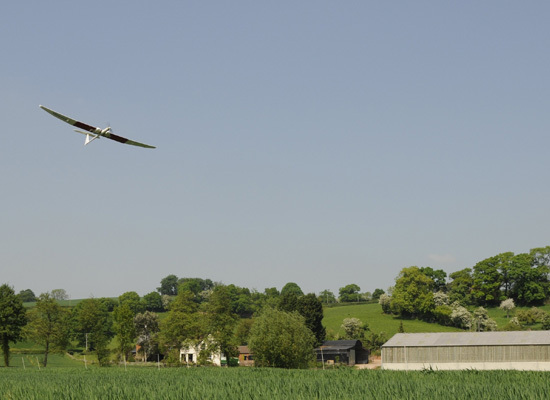 But will England's green and pleasant land become an aviary of sorts for pilotless airplanes (how about solar powered mini-dirigibles? ), whose droning bird songs in B-flat will commingle with the melodic twittering of traditional birds, the hypnotic chirping of crickets and the nostalgic rustling of grains against the wind? “Ah, the sounds of summer,” passing urbanites will plaintively sigh. Will America's majestic horizons darken with a murmuring data cloud kicking up a neverending electromagnetic storm? it never fails to suprise me how innovative your style of writing is, and it makes me enthusiastic about topics you write. this article is by far the most interesting i've read here, and hopefully, these things and ideas will be a starting point for a less expoited, and less globally warmed planet. i just can't do anything but hope all this will not contribute, even aggrevate the global paranoia we are suffering. if these technologies will actually be put to use on the whole planet, (and yet again i can't use another word) i hope that we will not be excluded from these places: fields, forests and so on. that we will still be able to walk and enjoy the sight and sound of biology, b-flat humming or not, with or without technology. NDVI is fascinating. 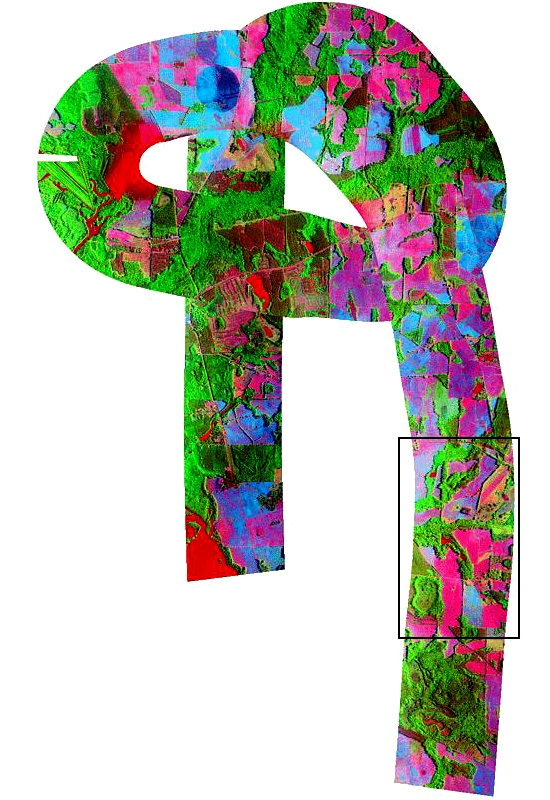 Several years ago, I was involved in a project to create a map of bird habitat using NDVI measurement of city land cover. They are really fascinating. Though NDVI isn't involved in this story -- as far as I can remember -- but William Saturno, an archaeologist specializing in Mayan civilization, once noticed in satellite images telltale differences in coloration of vegetation growing where he knew there were buried temples. Apparently, the Mayans built with limestone and lime plaster, which now affect the chemistry of trees growing on top of them. And then Saturno noticed other spots in places he hasn't yet explored. Some of those photos would look nice on my wall. I'd actually be really interested to hear what ethicists, etc. would have to say about your various (tongue-in-cheek) proposals. And to echo previous comments: this was an excellent read. I really dig your style of writing.